This is about the time New Year’s resolutions start to flounder. Unexpected things come up, like a nasty cold that puts you on the sidelines for a few days. Or an early appointment messes up your work-out schedule. Or somebody brings a box of doughnuts to the office. No matter how earnest our decisions to implement good changes, it doesn’t take much to throw us off our game. 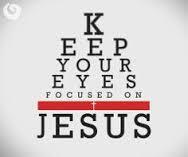 When He says His eyes are going to be on us “from the beginning of the year to its end” (Deuteronomy 11:12), that means every single day, the whole year through. No days off, no forgetfulness, no floundering. He is watching us all day today, and will continue tomorrow and the day after that. We will still be in His sights on March 9, and June 27 and September 19. By the time December 31st rolls around, He will still be watching. Not once does the Lord our God remove His watchful eyes from His people. This is not a raised eyebrows “don’t-misbehave-because-I’m-watching-you” kind of look. It’s more like a loving “I-can’t-take-my-eyes-off-of-you” gaze. It seems God is resolved to keep His eye on us this year. Maybe our best resolution would be to keep our eyes on Him all year, too. This entry was posted in Devo Drops and tagged beginning. Bookmark the permalink.